The Triple Olive slots have a simple theme. Click here to play! Rather than wealth, cute animals or sports like so many other slots, the Triple Olive 3-reel machine is all about classy cocktails, with one kind in particular - The Martini. If you were to ask a random person to name a cocktail, there are two names that immediately spring to mind. The first is the Martini, followed closely by the Manhattan. What does the Martini have over the Manhattan? An association with a particularly famous fictional British spy, mostly. At least, that's what used to distinguish them, but now the Martini also has the distinguishing feature of starring in one of the best slots games online in the Triple Olive slots. The Triple Olive game is a 3-reel slots game with two separate versions for different denominations: 25c and $1, each with a different progressive jackpot. It features classic cocktail imagery such as shakers, cocktail glasses, gin bottles, and of course the olives that distinguish Martinis from other drinks. 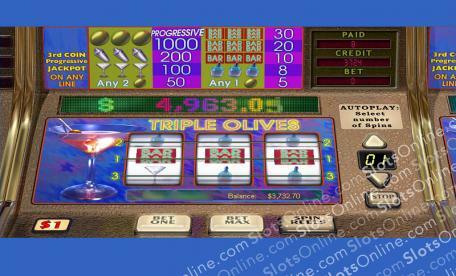 Be sure to have your favorite cocktail in hand when you play the Triple Olive slots, so you won’t be too shocked if you win the jackpot prize.